3) Before heating, make sure to remove the extra plastic sauce container (if any) inside the meal. 4) Cover the meal with the foil lid and place in the oven for 20-25 minutes* or until it reaches internal temperature of 165 F.
5) Use sauce as dip for chicken and veggies. *Cooking time is approximate and varies with oven. Shelf life: 3 days from receiving. This meal is based on one of our most popular dishes at Be Fresh Café. 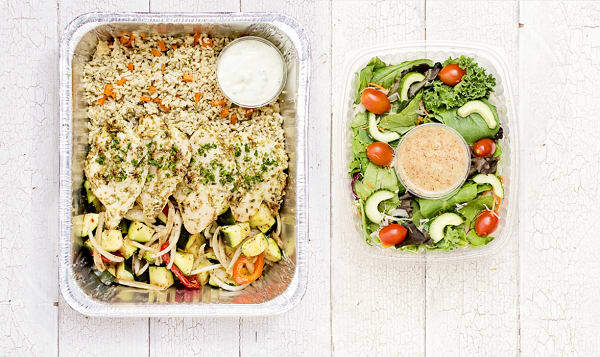 With Greek-herbed oven roasted chicken, rice pilaf, Mediterranean vegetables, and housemade tzatziki sauce, it's bound to be just as popular at your dinner table. Comes with your choice of free family-sized salad for a complete dinner.